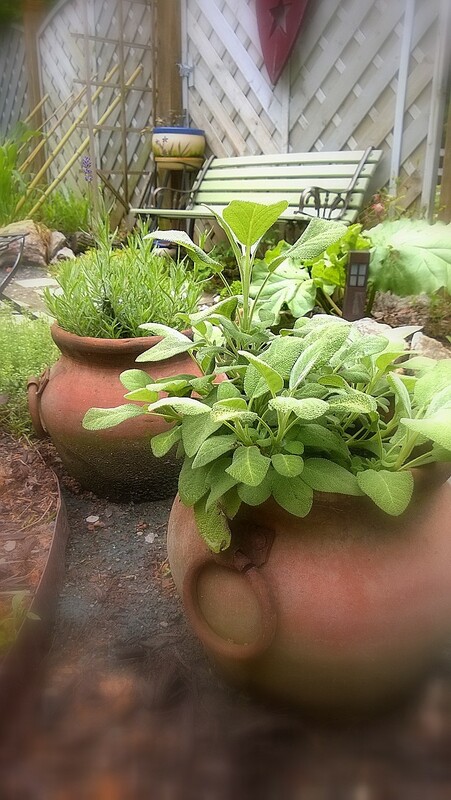 Not that growing in the dirt this year is any more cost effective…. well, not for me. Not when I have cabbage worms destroying every single plant on the west side of the garden. Or when I make a stupid decision and buy an organic fertilizer that has too high of a nitrogen content, and I end up burning the crap out of the balance of the plants. Needless to say, it’s becoming a money pit… and I just keep throwing money in it. Sure, you could say “Hey there guy, why don’t you start all your plants from seeds?” Well, I’ve done that. I don’t like my office looking like I ought to be living with Oliver and Lisa (for those of you older than 40 who get that reference). Besides, I lose focus with all those starter pots and plugs around. Everything either gets under-watered – or over-watered – or just ignored completely… and I have to go buy it all over again. Not that it’s been a bad year completely. 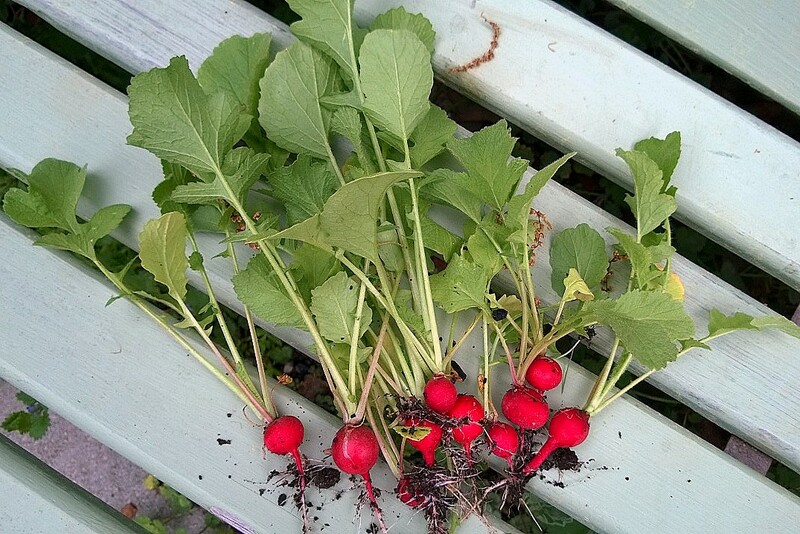 I did get several harvests of radishes, a heap of red onions, and a decent amount of greens (before I burned them to the ground). And yes… I’ve replanted. And I’m a little smarter this time around. Where I lost the greens, I’ve replanted with Sunglow Corn. It’s a hybrid variety of yellow corn that produces short 4′ stalks and 6 to 7 ears per plant. That should leave us with plenty for to eat and enough to pile on unsuspecting doorsteps. 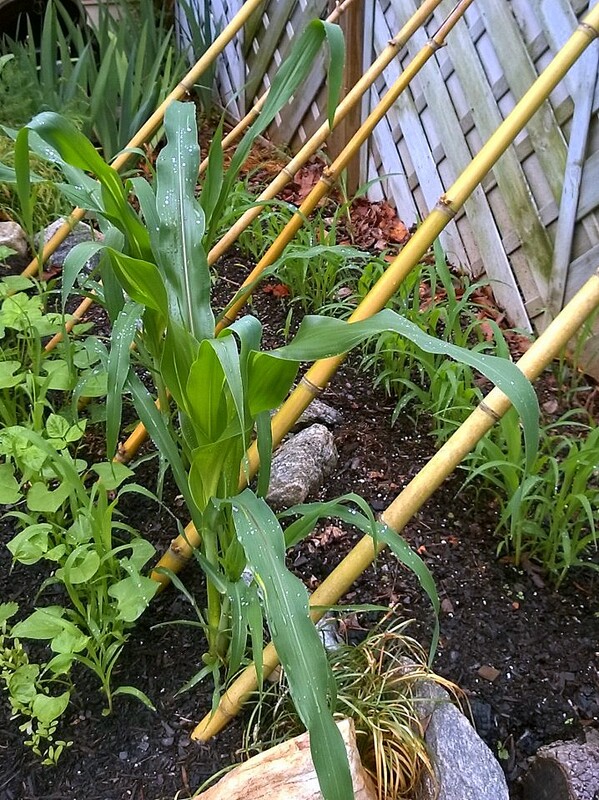 Along with the corn are Blue Lake Runner Beans that can trail up on the stalks and the bamboo stakes I’ve placed in the bed. 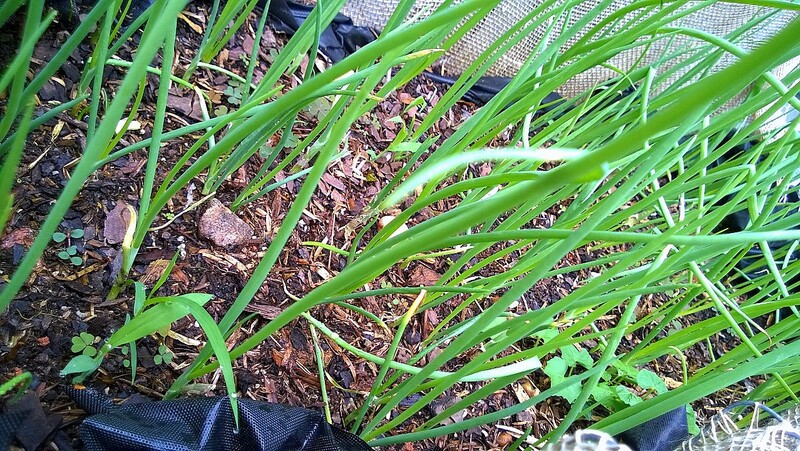 The carrots in the hanging beds have been reseeded, and I’ve added another 4 dozen late season white onions to the other basket. 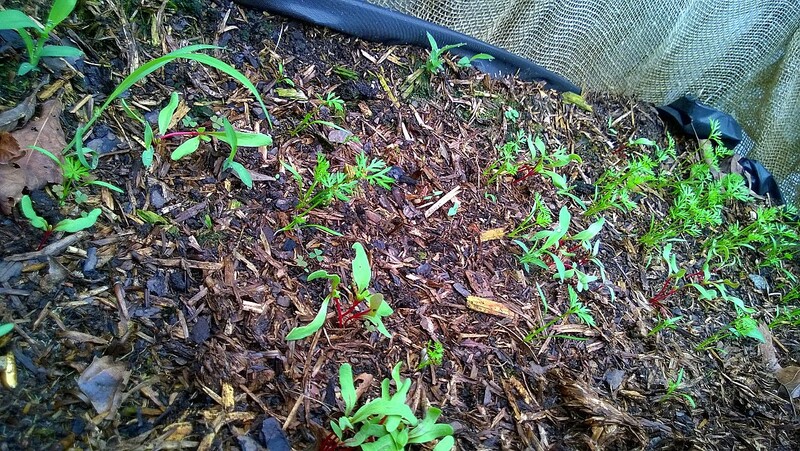 The little red plants are chard – which I’ve hedged my bets and sowed though out the garden in patches. 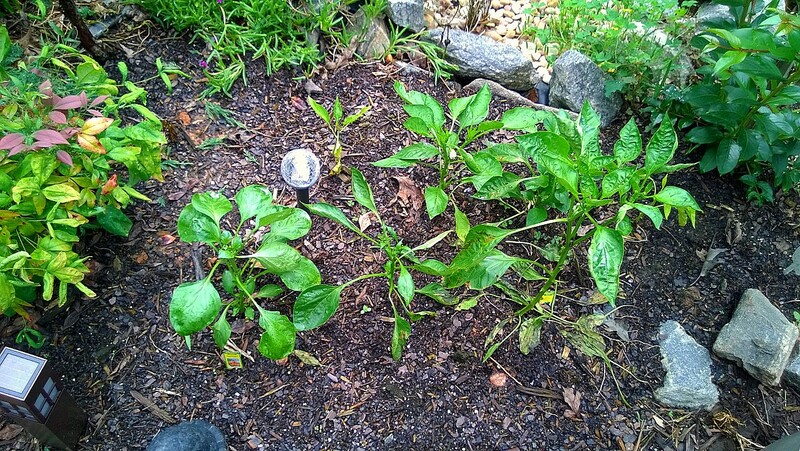 I’ve gotten new peppers (all Giant Marconi and Jalapeno) even though one Gypsy pepper survived the scorching. (It’s that sickly looking plant just behind the ball at the center of the photo.) It may or may not survive. 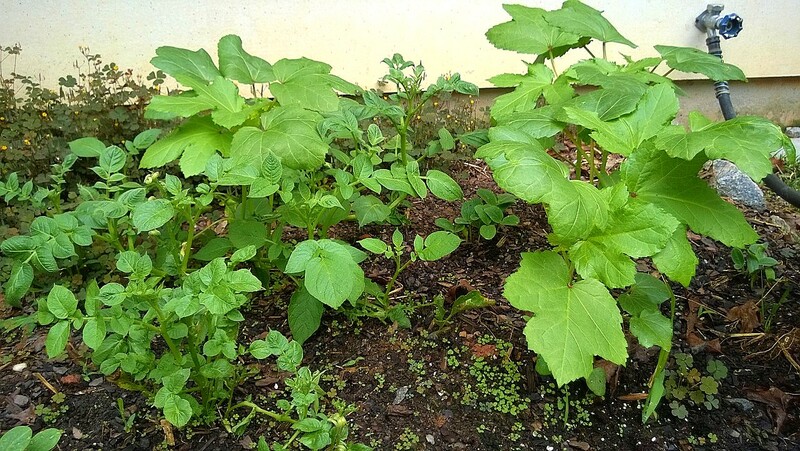 The okra stands are coming along nicely, and as a bonus we have 5 volunteer potato plants (they could be either Yukon Golds or Kennebuc) spring up from the rubble and remnants of the potato cages from last season. I’m encouraging them to produce – hopefully it will be something better than the marbles I got last year. I also found a paper towel stuffed with either Butternut Squash or Hubbard seeds stashed in a drawer from a couple of years ago – they’re coming up center frame. It’ll be a nice surprise whatever they are. Don’t get me wrong, I’m not bitter about gardening. This has always been a learning project – really, I’m no gardener. While I did get the gene from my dad to poke a bare stick in the ground and make it grow, I didn’t get the vegetable gene. As always, I’ll keep you up to date on the growing and harvests. Until then, go get your hands dirty. Hi Toby! 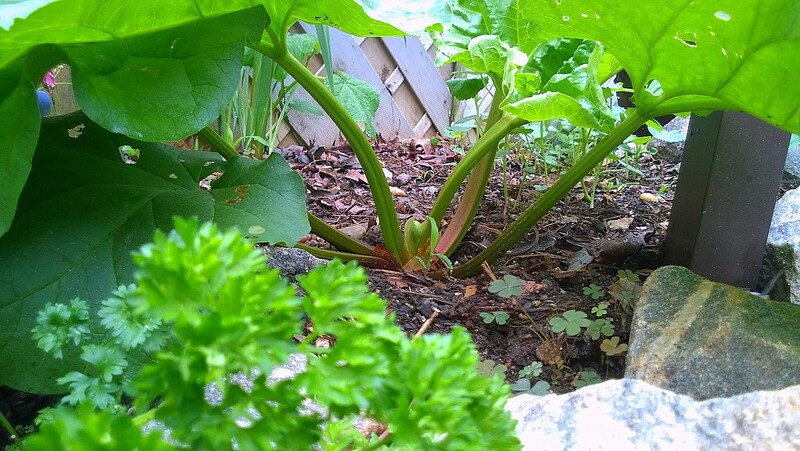 It is a joy to see your garden with all that produce. I guess to do it properly like you did costs quite a bit of money. I love gardening a lot but right now I can’t allocate as much time as I want to get my hands dirty. I’m collecting banana skins (hah..hah..) like you advised to “feed” my lime plant. I really want some limes, you know. My chillies don’t do too well either. I get something like one or two fruits at a time. Too little to amount to anything! I’m composting too. I have a little bin next to my kitchen counter to collect egg shells, peels and stuff. Hope that you get a good harvest! Hey Phong! I’m usually happy with 1 or 2 peppers at a time – any more than that I’m usually looking for someone to unload them off to. 6 or 7 plants produce just a boatload once they get into full swing. Let me know how the banana peels work for you – it always works wonders for the tomato plants here (and it supposed to do the same for citrus). Remember to mix that kitchen waste with some good “brown” components – (leaves / a little dirt / wood chips) you’ll need both to get a well-rounded compost. my hands were dirty today but alas, I have no sun. More ferns and hostas! I did not recall who Oliver and Lisa were, I had to click to peek. Thanks for putting the theme song in my head the rest of the day! Great blog, things are looking good! We aim to fill your head with all those tunes you can’t get rid of. Glad you’ve been able to get out in the yard and get something done between the spells of sweltering heat and downpours. It’s been catch and miss here too. Reblogged this on Plate Fodder.